As a professional within a rapidly-evolving healthcare environment, caring for patients is only part of your job. You also have to stay well-versed in the latest legislation affecting your patients, including new billing codes and shifting insurance coverage. The impact of the Patient Protection and Affordable Care Act (PPACA) is still unclear, however, we’d like focus on 4 key points that are specifically relevant to you to as a member of the integrative medicine community. Although these legislation changes originated with the federal government, implementation and interpretation of those laws can vary at a state level. One key point where the Supreme Court ruled in favor of flexibility for each state was in the employment of Medicaid expansion. However, as of September 2013, only roughly half of U.S. states have opted to expand the program. In addition to Medicaid, coverage of integrative medical services, including chiropractic, differ by state. Participating in your local state association’s lobbying activities is one of the best ways to advocate for coverage, and this is credited as one of the key reasons that language that may support integrative care was included in the PPACA. 2. Recognition as a “health provider” determines inclusion. Recognition of integrative healthcare not only varies state to state; it’s different by practitioner type. It will be important to confirm if your state currently fully recognizes your provider status in its defined minimum benefits for policies that comply with the PPACA. Each state’s essential benefits plan may also specify limits on benefits, which you may need to consider when creating a treatment plan that your patients can afford. One section of the law that may bring new opportunities to integrative healthcare professionals is the inclusion of non-discrimination language (Sec. 2706 of the Act, Public Law 111-148). It states, "No health plan or insurer may discriminate against any health provider acting within the scope of that provider's license or certification under applicable state law." In the Naturopathic and Acupuncture communities, licensure will likely continue to be a key driver of inclusion in these benefits. 3. The definition of “essential benefits” could define potential. Although the PPACA was written in a way that may have potential for greater coverage of integrative care, it will be the role of a few federal agencies to interpret the bill’s “legislative intent”, which will determine actual rule-making. This is what establishes the regulations that insurance companies, healthcare professionals, and patients need to follow. For example, outlining what types of services qualify as “essential benefits” (for example, chiropractic, acupuncture, or “alternative care”) will be decided by the Department of Health and Human Services. Staying informed about how the coverage of your specific health services could change will be important in the coming months. 4. Community Health Teams may create new opportunities. Joining or partnering with a community health team is one way that you may be able to introduce integrative medical services to newly-insured Americans. According to the PPACA, a community health team “may include medical specialists, nurses, pharmacists, nutritionists, dieticians, social workers, behavioral and mental health providers (substance use disorder prevention and treatment providers), doctors of chiropractic, licensed complementary and alternative medicine practitioners, and physicians’ assistants.”1 These teams will support the development of patient-centered medical homes by increasing access to comprehensive, community-based, coordinated care. You may want to investigate how being a primary care provider within this program could bring additional support to your practice. 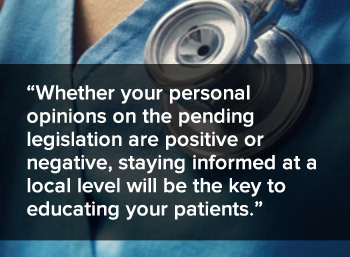 Whether your personal opinions on the pending legislation are positive or negative, staying informed at a local level will be the key to educating your patients. Showing transparency related to the financial implications of shifting insurance coverage is one way you can demonstrate that the patient experience is your highest priority. You may also want to send an email communication to your patients explaining how the PPACA may affect them specifically within the scope of your practice. Training your office staff to help people navigate these changes will help mitigate any confusion and instill confidence in the new year. 1. Compilation of Patient Protection and Affordable Care Act. Office of the Legislative Counsel. http://docs.house.gov/energycommerce/ppacacon.pdf. Published May 2010. Accessed Jan. 12, 2012.